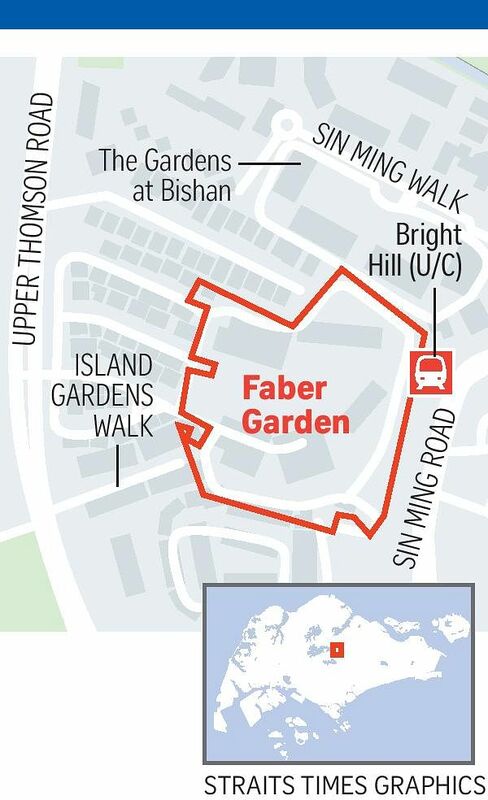 Faber Garden in Upper Thomson is up for a collective sale that would be the second largest ever here if a buyer meets the $1.18 billion reserve price. At that price, the 233 apartment owners would reap gross payouts of between $4.38 million and $6.75 million, while the three shop unit owners would get $1.99 million to $4.83 million, said marketing agent CBRE. The freehold estate is about 34 years old and sits on 5.05ha of land next to the Central Nature Reserve with Good Class Bungalows, landed houses and condominiums nearby. Windsor Nature Park and Lower Peirce Reservoir are within walking distance while the upcoming Bright Hill MRT station, slated to open in 2021, is nearby. The reserve price works out to $1,414 per sq ft per plot ratio (psf ppr) or $1,342 psf ppr if including 10 per cent bonus balconies. This includes development charges payable of about $106.7 million, comprising $52.8 million for intensifying the gross floor area plus further charges for the 10 per cent bonus balconies. Faber Garden has a plot ratio of 1.6 and a height control of 12 storeys. Its maximum allowable gross floor area is about 871,581 sq ft and 958,739 sq ft including the 10 per cent balconies. It could yield about 1,150 units based on the "70 sq m" guideline. "The site is the perfect opportunity for a developer to capitalise on its proximity to nature and develop a new development for families, away from the hustle and bustle of the city," said CBRE. Faber Garden tried for a collective sale in 2011 with an $830 million price tag but failed to find a buyer. "Various factors have moved since - including the fact that there is an MRT station soon... at its doorstep," said Mr Galven Tan, CBRE's executive director of capital markets. "At the current market, prices have moved to a point where this asking price is not unreasonable." He added that the large size of the freehold plot is also a draw. International Property Advisor chief executive Ku Swee Yong reckons the buyer would likely have to launch at upwards of $2,000 psf. If a deal goes through at the reserve price, it will beat this year's largest collective transaction - the $980 million sale of freehold Pacific Mansion in River Valley, a deal also brokered by CBRE. Pacific Mansion was acquired by GuocoLand, Intrepid Investments and Hong Realty in March. The record for the largest collective sale is held by the former Farrer Court, which was acquired for $1.34 billion by a CapitaLand-led group in 2007 and rebuilt into the 1,715-unit d'Leedon. But other estates eyeing collective sales could smash the Farrer Court record if they go through. The Dairy Farm is said to be asking for more than $1.68 billion, Pine Grove owners want at least $1.65 billion, while former HUDC estate Braddell View is said to be chasing $2.08 billion. Mandarin Gardens in Siglap could top the lot - it wants $2.48 billion. If these billion-dollar sites go through, they could "soak up the developers' cash more quickly", warned Mr Ku. This could hit other collective sales that are late to the game. The Faber Garden tender closes at 3pm on May 23.